Natural stone is known as a sophisticated and elegant choice, and it’s a nice way to show off your home or business’s personality. Stone isn’t just about its good looks, though: It has so much more to offer home and business owners. If you want to enjoy all the benefits of natural stone, Carpet In Motion is here to help. We are the Denver natural stone installation experts, and we will make the entire process as easy as possible for you. From choosing the stone to putting on the finishing touches during the installation, we are the only stone flooring specialists you will need. If you decide to go with natural stone, you will have a big decision to make: Which stone is the right one for you? The team at Carpet In Motion can help you make that decision, but it will ultimately be yours. That’s why it’s a good idea to educate yourself on your options. Then, our Denver stone flooring experts can start on your installation. Granite isn’t just for countertops, although that’s a popular use for this stone. You can also get granite floors. This stone is extremely durable, which is why it’s so popular in hotels and other commercial spaces. It’s scratch resistant, elegant, and an excellent choice for your flooring or countertop needs. Marble stone is in a league of its own. It has a classic appearance that instantly turns a room into a showpiece. It is more likely to stain than granite, though, so be careful where you put it. Consider using it in your bathroom or around the fireplace. Limestone has a gorgeous natural look that you can’t help but love. It’s subtle, so it won’t overwhelm the room. This is a porous stone, though, meaning that it’s susceptible to stains. If you want to add limestone to your Denver home or business, consult with Carpet In Motion before purchasing or completing installation. The team will let you know if the area you have selected is suitable for limestone. If you’re on a budget, consider manufactured stone. It contains natural stone chips, along with epoxy resins, cement, and polyester that create the look of natural stone without the same price tag. You can go with sandstone if you want to have a beachy look and feel at your home or office. It looks just like the sand you’ll find on the beach, but it is in tile form. Sandstone is porous and prone to scratching. It can also be slippery when wet, so be mindful of where you put it. 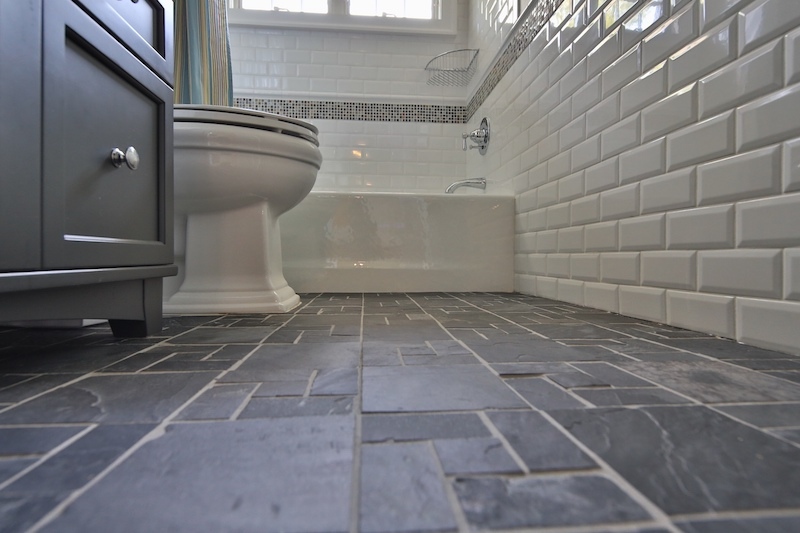 Slate is one of the most unique flooring options out there. It has a textured look that makes any room more interesting, and it’s durable enough for indoor and outdoor use. If you want an affordable option, consider travertine. It contains natural cavities, but your installation team can fill those cavities in, creating a polished finish. Its porous nature means you will need to maintain it over the years. Do you love spending time outdoors? Dress up your outdoor area with flagstone. This stone looks great around the pool and is the perfect frame for a firepit. You might feel a little overwhelmed with options, but we can help. Contact us for a free estimate and we will help you determine which type of stone floor is right for your home or business. Whether you need stone for the inside or outside, we can provide you with insight and help you make a smart choice.